Leewood Motor Club was founded in the 1970's and was a amalgamation of Lancs & Cheshire Autograss and Leesona-Holt rally club. Many of the founder & early members of Leewood Autograss Club have remained active members of the club up to the present day. This gives the club a deep well of experience and knowledge to aid it in making the correct decisions for both members, visitors and spectators. 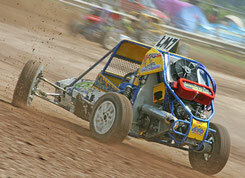 The location of Leewood Autograss' race tracks has floated around the Manchester area over the years, residing in Heywood, Bowlee, Bury, Birtle, Westhougton and Wilmslow. Heywood, however, remains the focal point of Leewood as the location for the monthly club meetings. Members and non-members alike are encouraged to attend the monthly meetings (1st Monday of each month at 8pm although some dates may change due to the Autograss Nationals) so that they can keep abreast of club matters and voice their opinion. It's also a good excuse to indulge in a few pints of your favorite ale and have a chat about the weekend's racing.